Finished up the term processing – the last modified checking seems to work. The last update field on the ontology page (see previous post) now shows dates. I’ve posted an updated copy of the arachadmin database export on figshare (let me know if the comments if you want me to expose it). Otherwise, time to move on to making these terms do some work. 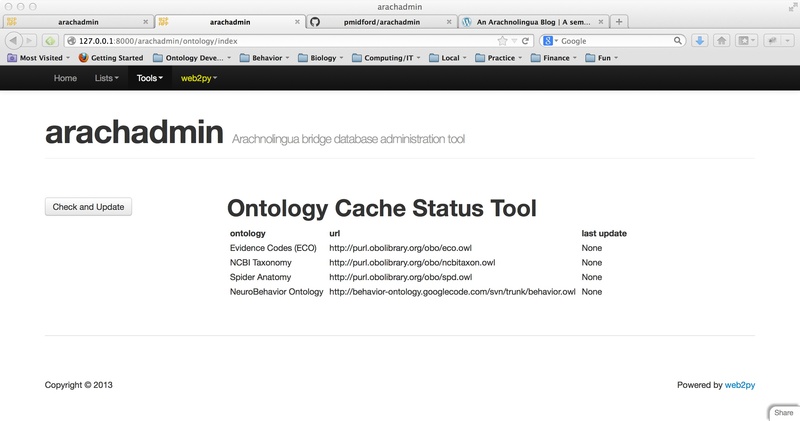 Finally have an update – the ontology page ‘check and update’ command loads owl files from each defined source (date checking not implemented yet), parses (sort of) the owl files (many assumptions related to the owl having been output by the rdf/xml generator built into the OWLAPI). After parsing, the terms and their labels are being added to the arachadmin database, which has been reorganized so all terms go in a common table, which indicates fields to specify both a domain (e.g., behavior, taxonomy, anatomy, etc.) as well as an authority – mostly important for taxonomic terms, but might be useful if annotation eventually requires using terms from both information artifacts (IAO) and the annotation ontology (AO). What’s it look like? Have a screen shot.